"Eminent scientists have said that global warming is as dangerous for our future as nuclear war. We have entered the uncharted territory of a global emergency, where 'business as usual' cannot continue. We must take the initiative to repair and protect this world, ensuring a safe-climate future for all people and all species.... It is now urgent that we take corrective action to ensure a safe climate future for coming generations of human beings and other species." "If we continue abusing the earth this way, there is no doubt that our civilization will be destroyed. This turnaround takes enlightenment, awakening. The Buddha attained individual awakening. Now we need a collective enlightenment to stop this course of destruction." "The world itself has a role to play in our awakening. Its very brokenness and need call to us, summoning us to walk out of the prison of self-concern." "Each of us must take complete responsibility for the world, as if the world's fate depended on our words and actions. And whether we know it or not, it does." "This surely must rivet the urgent, critical attention of anyone who takes the bodhisattva vows." "This is the time for humankind to embark upon a new historical epoch. We ourselves have to make the critical decisions, individually and collectively, that will determine our future destiny." 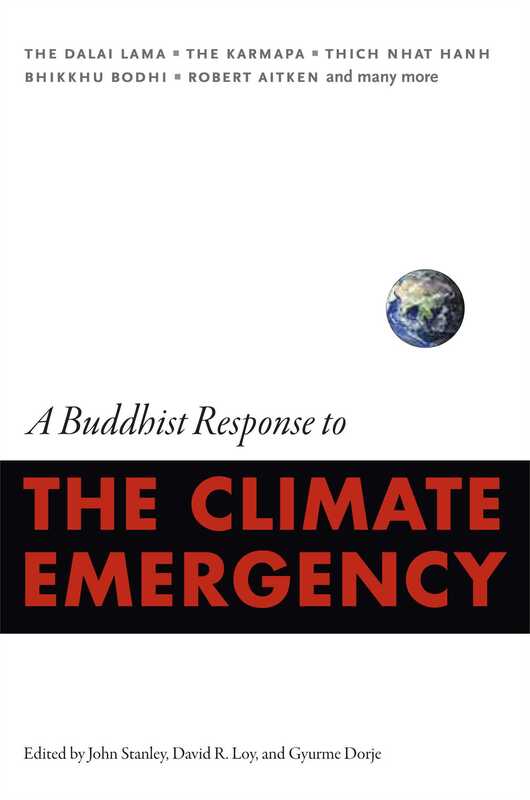 "In A Buddhist Response to the Climate Emergency, editors John Stanley, David Loy, and Gyurme Dorje aim to inform and inspire Buddhists to take action, and soon. The book challenges us to consider what climate change means for the bodhisattva vow. If Buddhists are fundamentally concerned with the alleviation of suffering, surely they have a distinct role to play in responding to climate issues. The authors presented in this anthology assume that awareness will bring about behavior change; however, by 'awareness' they mean much more than the usual environmental education. They literally mean awakening from delusion, engaging the deeper and more powerfully motivating force of spiritual awareness. This, they contend, is what it will take to awaken from the broad collective denial around climate change, to challenge the habitual patterns and hindrances that present such formidable obstacles to awakening. Foremost is the power of aspirational prayer, as suggested in many of the contributions by Tibetan teachers. Setting a strong intention is necessary for breaking through systemic social denial regarding the state of the climate emergency. The state of life on earth may ultimately depend on our capacity to act with true ecological intelligence." "The editors, John Stanley, David Loy, and Gyurme Dorje, have compiled a selection of provocative and even beautiful essays, interviews, and poetry by Asian and Western Buddhist teachers, almost all composed specifically for the book. The aspirational prayers are perhaps the most effective and inspiring. Rather than lecture from a distance, many of the teachers present with refreshing honesty their own struggles to articulate a position on climate change and address the myriad related problems that developing countries and Western nations face. The editors also provide introductory essays to the various sections of the books that serve as concise summaries of the science and potential dangers of the climate crisis." "At last--a clear exposition of our responsibilities as Buddhists in dealing with the enormous challenge of saving our planet. Two of the world's most influential Buddhists--His Holiness the Dalai Lama and Thich Nhat Hanh--are joined by many rinpoches and leading Buddhist scholars in helping us to define our roles. Our individual and our ecological predicaments are remarkably similar and the persuasive voices in this book help us to understand this--and give us some tools to 'take corrective action to ensure a safe-climate future,' as His Holiness puts it. Please read this book!"